The 2015 WARL Past Players and Supporters Re-union day was recently held at the North Beach Rugby League Club and was a cracker of a day. If you didn’t make it, well .. you missed out on something special. More than 150 past players, referees, administrators and supporters attended the day and were highly entertained with special guest speaker, Billy Smith (former St George, NSW and Australian half-back and Legend), the North Beach 1980 Premiership team that was honoured as well as Dennis Hawkins and John Thompson who were inducted into the WARL Hall of Fame. John Moore (WARL PPS President) welcomed everybody and kicked off the proceedings by announcing the winner of the WARL Junior Club Person of the Year which was awarded to Jack Lund from the Mandurah Rugby League Club. This award is sponsored by the Past Players and Supporters Association and is presented to the junior club person who is recognised as a major contributor both on and off the field to the continuing growth of their club and WARL in general. The Award consists of the perpetual trophy and also a $250 voucher and is announced at the WARL Junior Presentation Awards. John then handed over to James “Sully” Sullivan from the WA Men of League. Sully had a wonderful time interviewing Billy Smith and Billy’s stories and antics had the whole crowd in stitches (even if some of it was a little un PC!!).. Thanks so much to Billy for giving up his time while in WA to attend our function. it is very much appreciated. After a short intermission where the North Beach club provided some fabulous finger foods to the patrons, the presentations continued with the 2015 celebrity team. This years celebrity side was the 1980 North Beach 1st Grade Premiership team. WARL Hall of Famer and then coach Noel Williams, talked us through the journey of making and winning the 1980 grand final. He introduced the team members who were presented commemorative medals in honour of their achievements. The side boasted some great name like Eddie Campbell (Hall of Famer), Arthur Barugh, Dean Williams, Jason Coutts, Dave Arbouin, Rick Coster, George Taylor, Richard White, Mark Murphy, Tim Duff and Garry Hookham. Congratulations boys, what a wonderful way to remember and celebrate what was an amazing achievement. Once all of the photos were taken, Len Castle made a toast to absent friends of whom we have lost a few this past year unfortunately. He also used the opportunity to create awareness about men’s depression which is a cause he is very passionate about. Thanks Lenny, as a founding member of the Past Players Association, no re-union would be complete without a few words from you and it was a pleasure to have you there. Last but certainly not least was our Hall of Fame inductees. Dennis Hawkins from South Perth and John (Crowie) Thompson from North Beach were the deserved recipients. Welcome gentleman, you both have your names and achievements etched into the history books of WA Rugby League. We would like to take this opportunity to thank the efforts of the North Beach committee for making our day a great success. It was an absolute pleasure to bring the Past Players re-union to your club and we hope to do it again soon. THANK YOU. 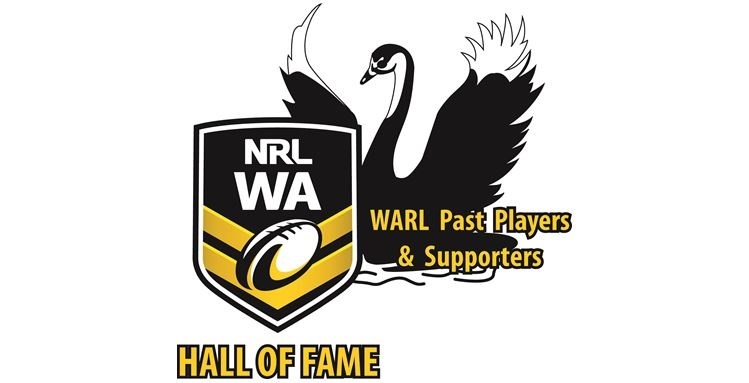 Next Year we have a BIG BIG function planned which will honour and celebrate all of the past winners of the WARL best player awards. Over time this has been named, the Brice Trophy, Rothmans Medal and now is known as the Ken Allen Medal. All of the details for this event will be announced in the New Year… Stay Tuned! As a footnote; We need to keep this fabulous tradition alive, so if you are a WARL Past Player, Referee, Administrator or Supporter, have about 10 hours a year to spare and love interacting with men and women that shaped Rugby League here in WA, We would love to hear from you !! If you would like to get involved with the Past Players Association, please contact us on warlpastplayers@live.com.au ..